Peerblock is well known to frequent torrent users and those who value their privacy on the internet. There was a time when everyone was all about Peerblock. However, it is not being actively developed anymore, pushing users to look for alternatives to Peerblock that can better protect them online. This article discusses the best Peerblock alternative, either for torrenting purposes or for simply protecting one’s online privacy. Peerblock is a spin-off of Peerguardian, an open source firewall product. Both Peerblock and Peerguardian work by blocking selected IP addresses from connecting to the user’s computer. These firewall products can block both incoming and outgoing connections to the selected IP addresses. Once Peerblock is installed, users can add any IP address they want to block in the configuration. Most Peerblock users take advantage of blacklist services such as i-BlockList.com, which contains and maintains a list of IP addresses of governments and other organizations that may be checking out internet activities. This is particularly helpful for torrent users who want to hide from authorities since Peerblock can block IP addresses of copyright enforcers, police, and other government organizations. Peerblock and Peerguardian lessen the chance of being detected. The main difference between Peerblock and Peerguardian is that Peerblock is developed for Windows, whereas Peerguardian is only being developed for Linux and Mac. There can be negative effects on internet performance when thousands of IP addresses are being blocked. Websites might be unable to load because some resources are blocked. When torrenting, you will only have a limited number of IPs to connect to, and even fewer hosts. You cannot expect for an IP blacklist service that is manually updated to be fully correct and complete. And even using this service may not prove effective as an enforcement agency can just track your activities from a different location with a different IP address. They can track you because the IP address they would be using is fresh and not yet in the list of banned IP address. Peerblock’s job is to block IP addresses of other users, but it does not hide your own IP address. So when you try to access a torrent file, your IP address is visible to everyone. Peerblock also does not encrypt your network traffic, which means that anyone, even your Internet Service Provider (ISP) has the freedom to access your data and know what you have been doing online. What are Some Peerblock Alternatives? This is an application which was developed by Beethink, can also be used as a simple firewall. It prides itself as an easy-to-use IP address blocker that works on Windows. Simplewall is a filter and content filter application which is being positioned for small and medium enterprises who want to protect their online activities. One of the best solutions to the privacy problem on the internet is a Virtual Private Network. For those who are looking for ways to hide their online activities from snoopers, a VPN can do far more than Peerblock or applications similar to it. While Peerblock only acts as a firewall that keeps certain IP addresses out of the user’s network, VPNs encrypt all data packets that are being sent and received. Herein lies the major difference between Peerblock and VPNs. Advertisers, your ISP, and government agencies that might be prying cannot see what you are doing on the internet as long as you are using a VPN. This is because all data packets are heavily encrypted. In addition, your IP address is hidden and masked by a different IP address. With Peerblock, people whose IP addresses are not blocked can still see your online activities. Same people can also see your IP address. All you need to do is look for a VPN service provider that offers decent features such as excellent speed, reliable encryption standards, and most importantly, has a no-logs policy. Can a VPN Be Used with Peerblock? People who have found a great privacy solution provider in VPN have altogether avoided Peerblock and applications similar to it. Still, there are others who use both methods. Is this possible? While there are a lot of online discussions regarding this, it is important to stress that using both solutions can result in some hiccup in terms of performance. If you are looking for anonymity and privacy in doing online activities, a VPN can do more than Peerblock. Remember that Peerblock can only block incoming and outgoing traffic from specific IP addresses that you need to configure on the application. It does not encrypt your network data, nor does it hide your IP address. Therefore, it may not be wise to use Peerblock with VPN. 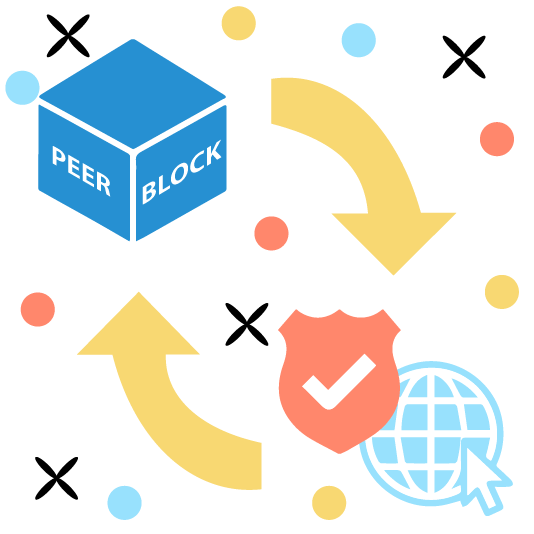 The effectivity of Peerblock in hiding the file-sharing activities of people has long been contested. It does not give users anonymity at all, as it allows anyone to snoop and gather data as long as their IP addresses are not banned. The right VPN service provider is more effective, not that LimeVPN promotes illegal download of copyrighted materials. Furthermore, VPNs can do more than aid in file-sharing activities. It can protect users from cybercrimes such as identity theft, ransomware, and email phishing. It can even stop advertisers from getting sensitive and personal information. Indeed, VPN is the best Peerblock alternative as it can do more than what Peerblock can do for its users.